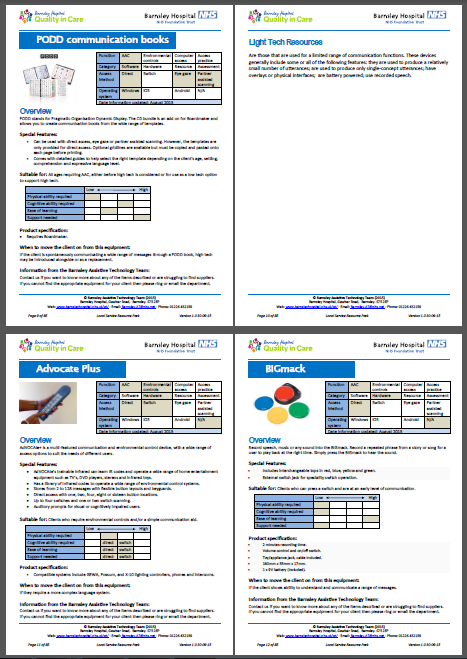 Following the well received publication of our Local Service Resource Pack last year, an updated version has now been produced, including even more information about Augmentative and Alternative Communication, Environmental Control and Computer Access devices, software, hardware and other resources. The pack is designed as an easy to use resource and is hoped to be particularly useful for supporting those working in local services within the Yorkshire and Humber Region, who may be expected to provide and support clients with using assistive technology that does not come under the remit of the Barnsley Assistive Technology Team. This may include local Speech and Language Therapists, Occupational Therapists, Teachers and Teaching assistants. The guide includes ideas including communication aids and apps, computer access equipment, simple devices for environmental controls as well as details of assessments, software and other resources that may prove useful. We hope that the resource will be useful and welcome any feedback, including any other products that you feel it would be useful to include. We hope to continue to update the resource on an ongoing basis. This entry was posted in AAC, access, computer-access, Environmental Control, mounting, Resources on 07/03/2016 by Jenny Scott. Accessible app developers of the future? Yesterday I gave a presentation at Sheffield Hallam University following an invitation from Dr Peter O’Neill, Senior Lecturer and leader on modules including mobile applications and programming for computing. The students were from the BSc Mobile Application Development course and an MSc Group Project. Considering that the audience could be web and app developers of the future, this was an opportunity to remind of the need to design for accessibility. To set the context I explained the role of our service in assessing for and providing electronic assistive technology such as AAC, EC and computer access and described how some of our clients access this technology. An illustration was given of well established methods such as switch access, alternative keyboards, mice, eye gaze, voice recognition, screen reading software and use of inbuilt accessibility features in Windows, iOS and Android. Leap Motion – non contact gesture input from hand and finger movement. Google Glass – wearable computer and optical head mounted display. Google 3D Sensors – Project Tango – phone with motion tracking and depth sensing. Hopefully we enthused the students with the potential of using these novel technologies for Assistive Technology and in thinking accessibility in everything they did. There are lots of exciting potential student projects in the area of Assistive Technology and Accessibility. We will continue to develop collaborations between the Barnsley AT Team and University groups such as Sheffield Hallam – hopefully, at some point, building on the Project Possibility model in the UK. This entry was posted in AAC, access, computer-access, Environmental Control, presentations, projects, software, training on 11/03/2014 by marcusfriday. There was a lot of interest in our ‘Introduction to Electronic Assistive Technologies’ course that we ran last week, so we have decided to run the course again on Thursday 12th September 2013. For more information about what is covered in this course and the other courses in the series, please see our website or download the flyer from our website. Courses are avaliable to professionals working in our service delivery areas (Barnsley, Rotherham and Doncaster). We may accept requests from other parts of Yorkshire and Humber subject to availability and a nominal charge. This entry was posted in AAC, access, computer-access, Environmental Control, presentations, service delivery, training, wheelchair controls on 24/07/2013 by Vicky Johnson. The Assistive Technology Team have worked with Susan since 2006. When we first met Susan she was finding computer use with a standard mouse and keyboard very difficult and eventually this became impossible. She was also struggling to control other equipment around her house. As this video shows, Susan is now able to control her computer, her door, phone, TV and other equipment, all using her head! As with most people, this set up evolved over a period of time, as she tried different options and also as Susan’s condition (Multiple Sclerosis) changed. The rest of this post describes her journey and how the equipment was set up for Susan. This entry was posted in access, Client, computer-access, Environmental Control and tagged computer access, Environmental Control, integration on 09/10/2012 by marcusfriday. One of my clients has a bit of difficulty typing because of his motor neurone disease (MND) – he is a pretty good typist, but now occassionally presses the ‘wrong’ key – this is generally one of the neighbouring keys to the one he wants. For example he might type hjello for hello. Normally an approach to this is to use a physical keyguard for example, as supplied by Maxess or inclusive (other suppliers are available!). However, this seems a bit ‘over the top’ for this client who only has occasional problems. So, we made a simple ‘virtual’ keyguard. This filters out key quick presses from neighbouring keys. You can download and try the script from here. To run the script, you need to download AutoHotKey . Both of these programs are free and open and provided with no liability. Hopefully they will be useful to someone else. AutoHotKey is a great little program that we fairly regularly use to make bits of the computer more accessible – for example getting keys on a keyboard to do things that people find difficult to do otherwise. This entry was posted in access, computer-access on 22/08/2012 by barnsleyat.